The setting could not have been more fitting for the course and the birth of a new tradition. Such were the opening words which described the third Université d’été, an international summer program in Europe for college students sponsored by the Austrian Society for the Defense of Tradition, Family and Property (TFP). This year’s European experience, dubbed Sommerakademie in German, was held from July 26-August 2 in Gaming, Austria at the restored fourteenth-century Carthusian Charterhouse, known as the Kartause Maria Thron, nestled in the foothills of the Austrian Alps. 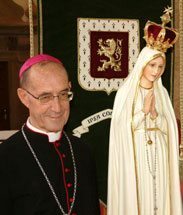 Foremost among the invited guests was the unexpected visit of the International Pilgrim Virgin Statue of Our Lady of Fatima who presided over the first four days of the seminar. The TFP was especially honored to have Bishop Juan Rodolfo Laise, Bishop Emeritus of San Luis (Argentina) who celebrated daily Mass. Foremost among the guests: the Pilgrim Virgin Statue and Bishop Juan Laise. Participants were invited to discuss history and current events from the perspective of the book, Revolution and Counter-Revolution by Plinio Corrêa de Oliveira. The main theme was that of Christian Civilization as founded in the past and its perspectives for the future. Talks were followed by discussion periods and simultaneously translated into English, French, Polish and Portuguese. The setting could not have been more fitting for such a discussion. The Charterhouse, which served as a barracks during the brutal Soviet occupation of Austria, has weathered the tempests of the Protestant, French and Communist Revolutions. 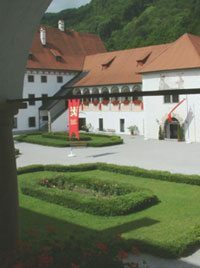 As a backdrop for a discussion of Christian Civilization, the Charterhouse itself was directly connected with the historic development of Austria’s rich Catholic culture and history. The cultural dimension was not forgotten. A string quartet plays Viennese favorites. Setting, timely topics, qualified faculty and eager students were the right ingredients to supply not only an intellectual challenge but all the elements for confirming a new counter-revolutionary tradition. In fact, the Sommerakademie immersed its students in the richness of Austrian tradition. Whether it was a visit to see the crown treasures, a walk through Vienna’s city center or indulging in a Sakertorte pastry, all could see firsthand what Christian Civilization built and produced. Participants visited Catholic Austria with a pilgrimage to the picturesque town of Mariazell where a small medieval statue represents the Blessed Virgin as “Mother of Austria.” Inside the baroque church, the richly endowed grotto is testimony to the answered prayers of so many Austrians over the centuries and the footsteps of modern pilgrims reveal that supplications continue to be heard today. Meetings, discussions, prayers and outings filled an all-too-short week. The closing banquet helped seal new friendships and turn lessons learned into firm resolutions. 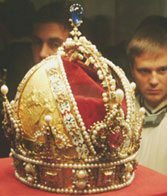 Participants view one of the crowns of the Holy Roman Empire in Vienna. Students left with more than just memories; they gained new insight. Unlike so many modern educational institutions which fragment knowledge, the essence of the TFP Université d’été seeks to impart a truly universal Catholic vision of history and reality. However, vision alone is not enough. Turning this vision into action is just as important. Students at the Université d’été have the elements to apply this vision to daily life and engage in their own counter-revolutionary struggles in favor of Christian civilization. With the successful conclusion of the third Université d’été, the TFP celebrates a new tradition born amid a modern world that hates tradition. However, it also celebrates a new hope seeing that Catholic ideals return with ever-greater vigor in the souls of so many young people from all over the world. This entry was posted in Events of 2003 by John Horvat II. Bookmark the permalink.